The U.S. stock market is almost at an all-time high. Macro data is still weak, although it has improved a little recently. 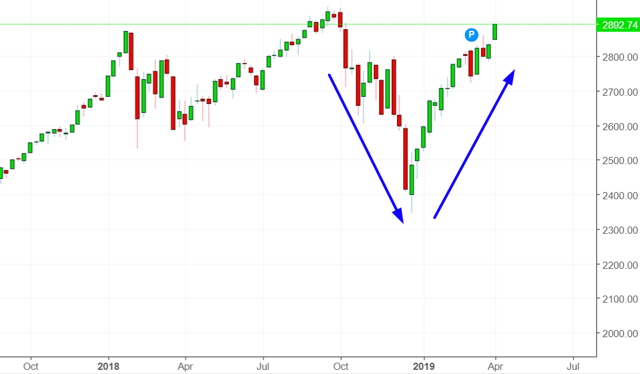 The stock market's price action points to new highs for 2019. After a nonstop rally, the S&P is now just within 2% of making all-time highs. This illustrates a key point when investing/trading the U.S. stock market - you want to be very selective when turning bearish. Most underperformance comes from being underinvested. The medium-term direction (e.g. next 6-9 months) is mostly mixed, although there is a bullish lean. The stock market's short term is neutral. While the bull market could keep going on, the long-term risk:reward no longer favors bulls. 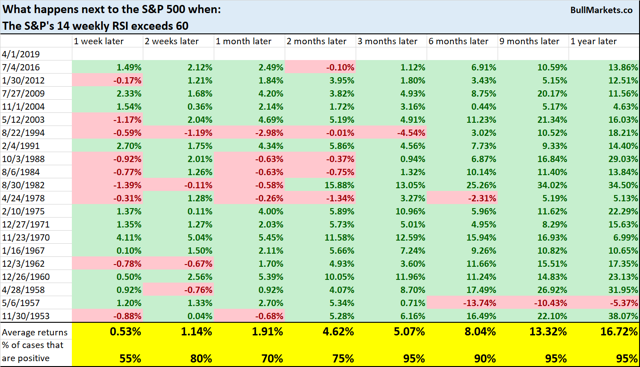 Towards the end of a bull market, risk:reward is more important than the stock market's most probable direction over the next 12+ months. 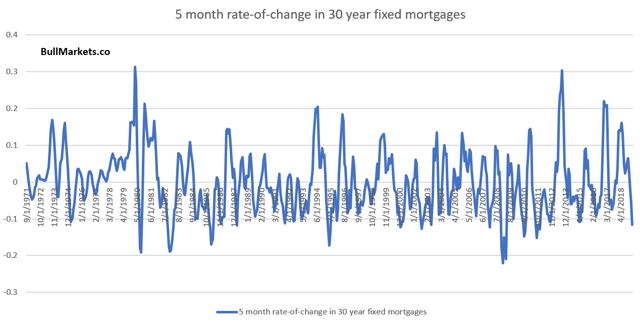 Housing - the earliest leading indicator - starts to deteriorate. This has occurred already. The problem of course is that as the economy becomes "as good as it gets", all the risk is to the downside. And, with Unemployment this low, the economy is indeed "as good as it gets". 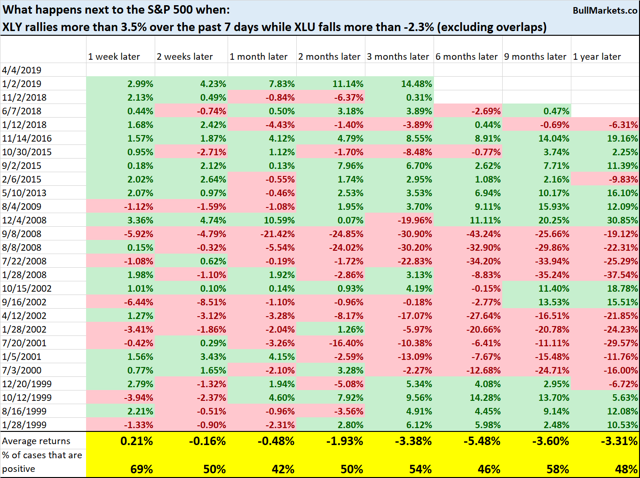 Here's what happens next to the S&P when the yearly % change in overtime hours fell below -6.5%, while Unemployment was under 6% (i.e. late-cycle). The conflict between corporate profits (bullish for 2019) and labor markets (mixed for 2019) illustrates the biggest problem with predicting bull market tops. 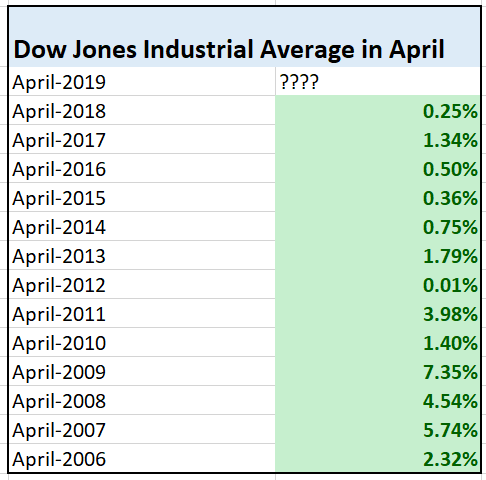 It's very easy to be a year too early when calling bull market tops. For example, many great investors and traders thought that the 1990s bull market would end with the Q3 1998 crash. It didn't. The bull market lasted another 1.5 years until 2000. The S&P 500's earnings growth will probably turn negative in Q1 2019. *NIPA profits tends to lead the S&P 500's profits by 3 quarters. 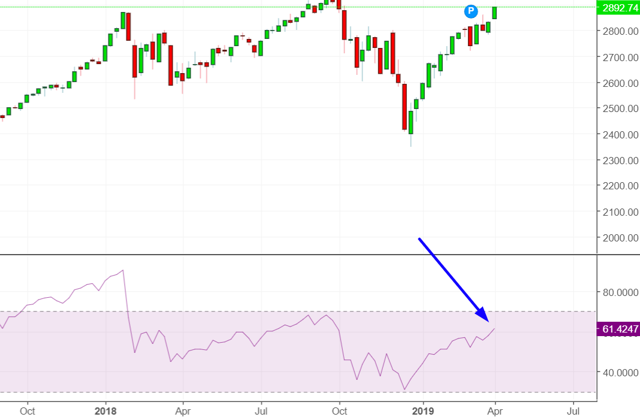 With NIPA profits still trending upwards, this suggests that the S&P 500's profits will resume growing after Q1 2019 for a few more quarters. The New York Fed has created a Recession Probability Index by inverting the 10 year - 3 month yield curve. 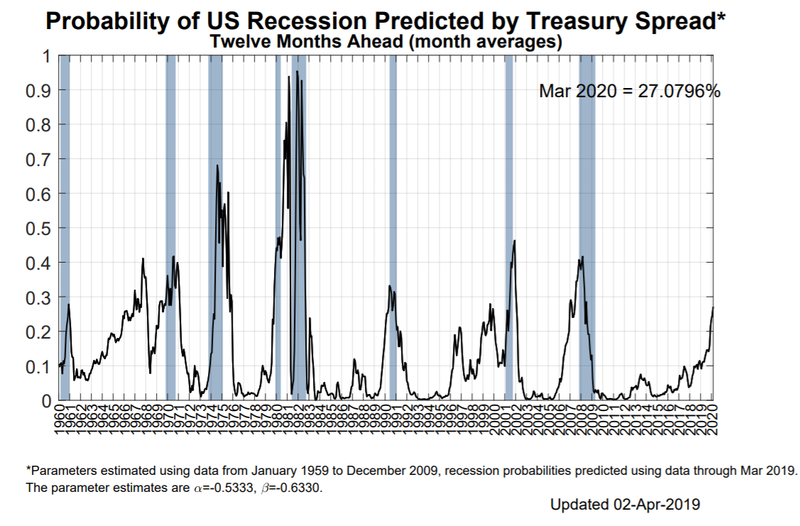 Here's what happens next to the S&P when the probability of a recession exceeds 27% according to this index. 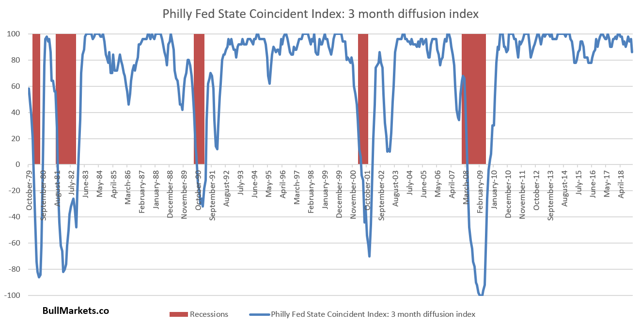 The Philly Fed creates a state coincident index, which looks at whether individual state economies are improving or deteriorating. The Philly Fed then combines these into a 1-month and 3-month diffusion index to gauge the health of the collective U.S. economy. As you can see, the 3-month diffusion index is still quite high right now. Previous recessions and bear markets began when the Philly Fed State Coincident Index was lower. The Citigroup Economic Surprise Index continues to fall, leaving some market watchers to scratch their heads wondering how the U.S. stock market can keep going up when "the economy is bad". 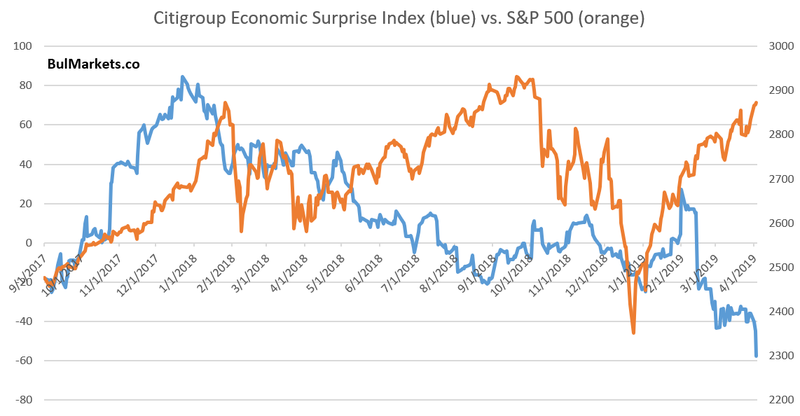 In a common misunderstanding, the Citigroup Economic Surprise Index doesn't measure the state of the economy. It merely measures the state of economic data versus analysts' expectations. It is entirely possible for economic data to improve yet miss analysts' expectations if expectations are too high. 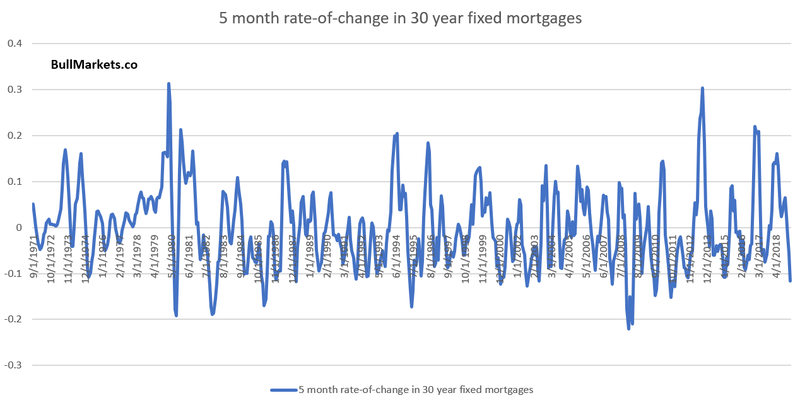 Here's the 5-month rate-of-change in 30 year fixed mortgages rates. 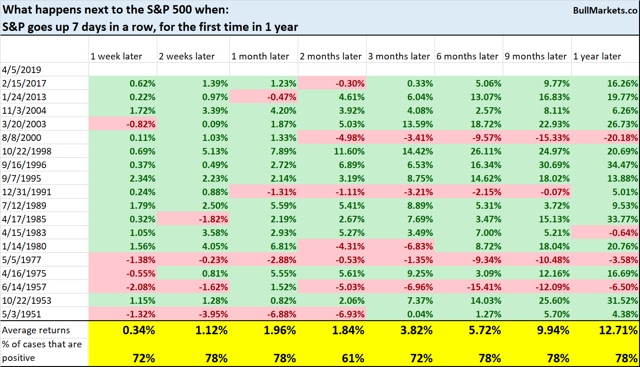 Conclusion: The stock market's biggest long-term problem right now is that as the economy reaches "as good as it gets" and stops improving, the long-term risk is to the downside. The end of a bull market is always very tricky to trade. 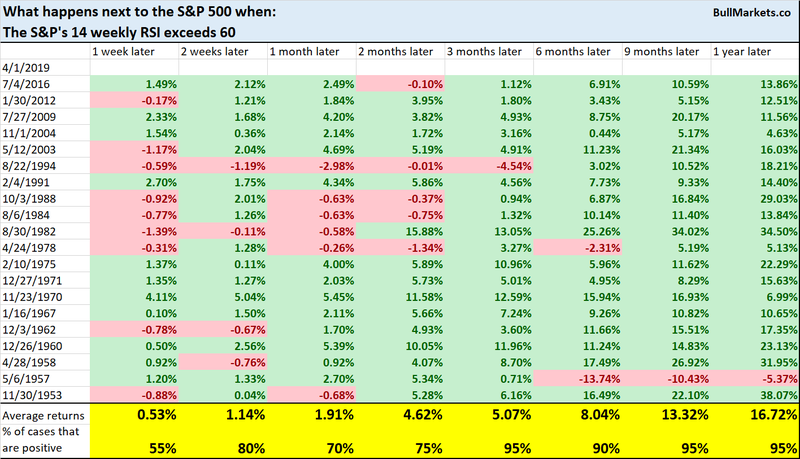 The stock market can go up a lot in its final year, even if the macro economy is deteriorating (e.g. 2006-2007). That's why it's better to focus on long-term risk:reward instead of trying to time exact tops and bottoms. 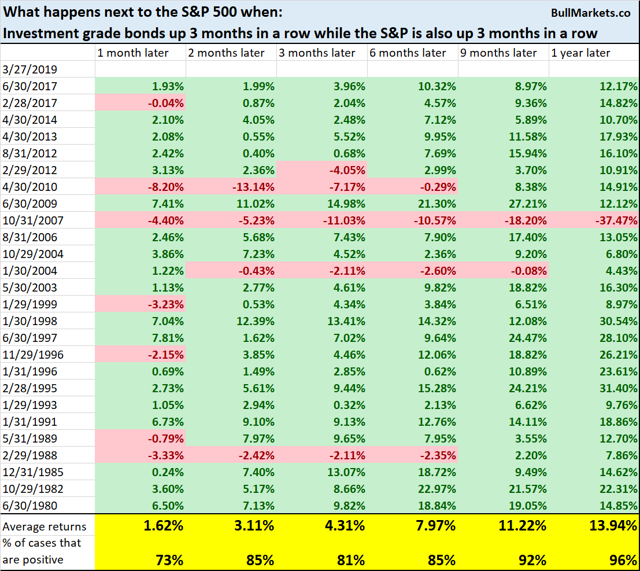 Even when you think the top is in, the stock market could very well surge for 1 more year. (Just ask the people who thought that the dot-com bubble would end in 1998. It lasted another 1.5 years). The stock market's price action demonstrates a bullish lean over the next 6-12 months. 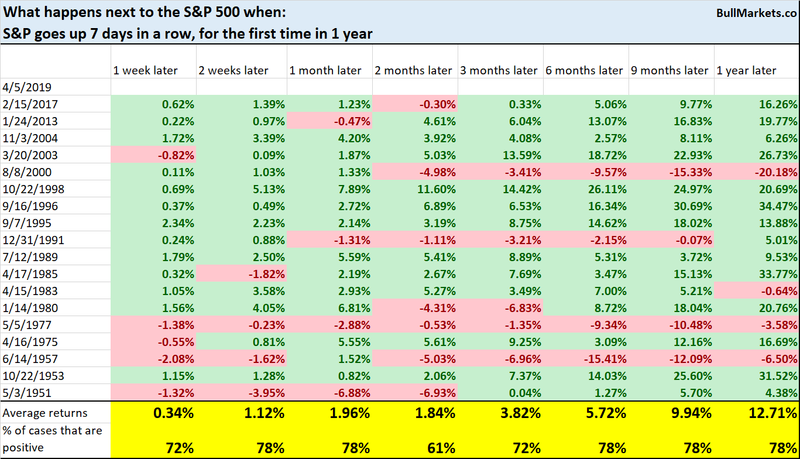 Here's what happens next to the S&P when it is now within -1.5% of a 3-year high, after being more than -15% below its 3-year high sometime in the past 5 months. 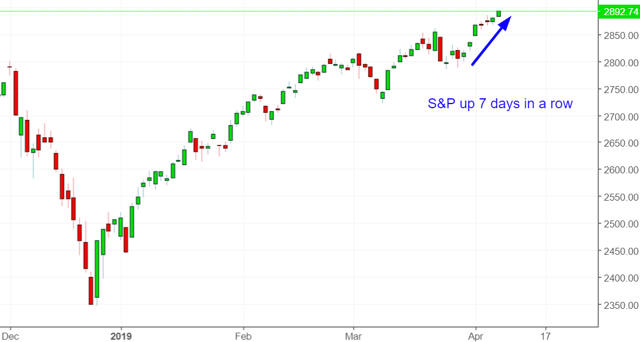 The S&P faces some potential short-term resistance, after which its forward returns are more bullish than usual. 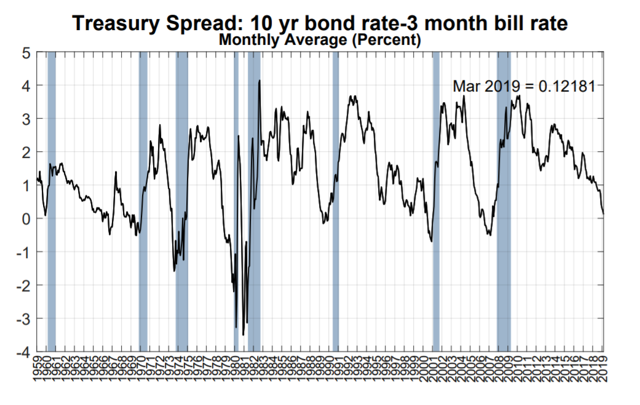 The Put/Call ratio is trending down. The ratio's 50 dma is now more than -0.08 below its 200 dma. Here's what happens next to the S&P when the Put/Call Ratio's 50 dma is more than -0.08 below its 200 dma. Somewhat short-term bearish, but is mostly bullish for stocks 3-9 months later. In an act of perfect symmetry, the S&P's 15 week rate-of-change has gone from less than -15% to above +15% in 15 weeks. It's been a V-shaped recovery. 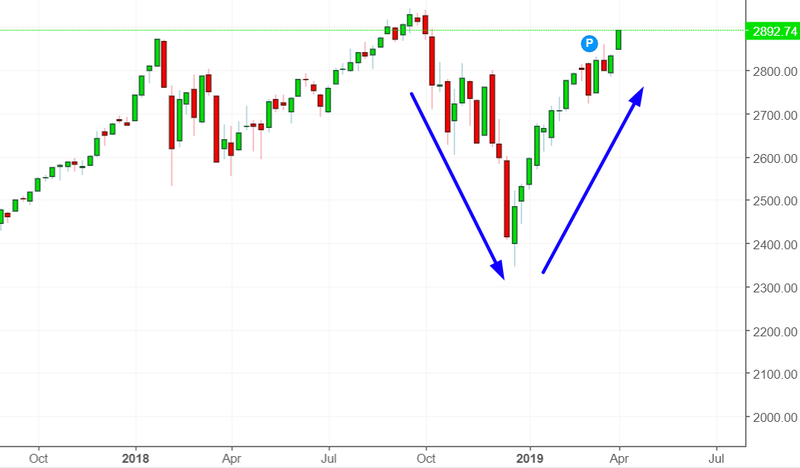 Historically, these V-shaped rallies could encounter short term resistance but were more bullish than bearish 9-12 months later. The S&P's momentum is strong, with its 14 weekly RSI now above 60. This week saw extremely light volume in the stock market. For example, SPY's volume this Tuesday was more than -50% below its 200-day moving average. Traditional technical analysis sees low volume rallies as bearish because "volume should confirm price". 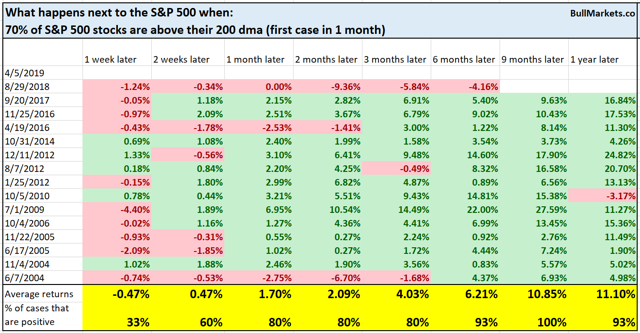 Here's what happens next to the S&P when SPY rallies more than 20% over the past 15 weeks, while SPY's volume also falls more than -50%. Breadth is recovering as the stock market rallies. More than 70% of the S&P 500's stocks are now above their 200 dma. 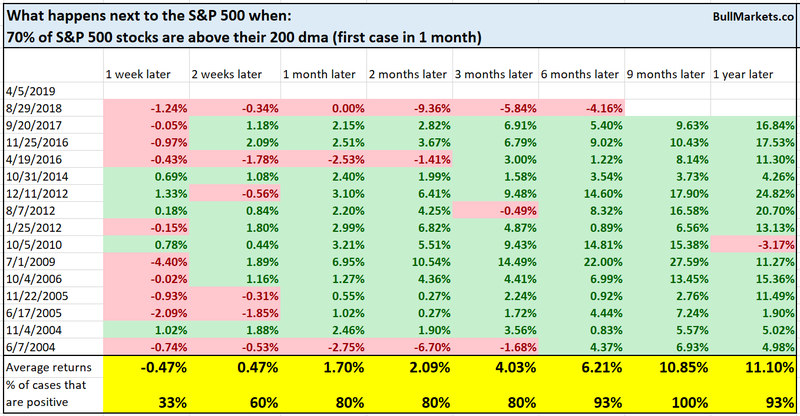 From 2004 to present, this was a short-term bearish sign for stocks, but was positive after that. *Be careful when using indicators with less than 40 years of historical data. 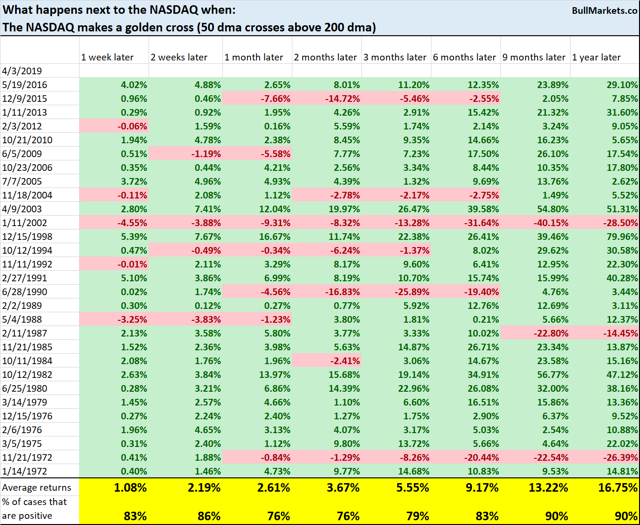 The returns are misleading simply because you don't have enough varieties of bull markets and bear markets in the data. There have been a lot of gaps this week. In fact, the S&P has opened higher than yesterday's close for 9 days in a row! Traditional technical analysis sees gaps as "bearish" because "gaps should be filled". 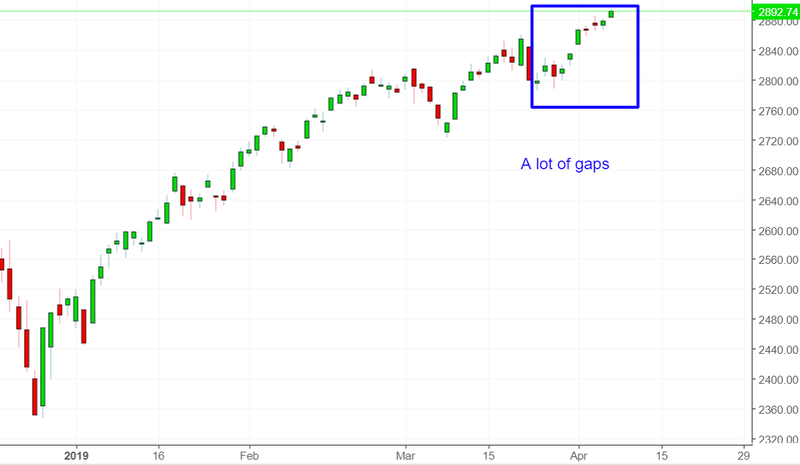 I wouldn't treat gaps as bearish for the stock market. 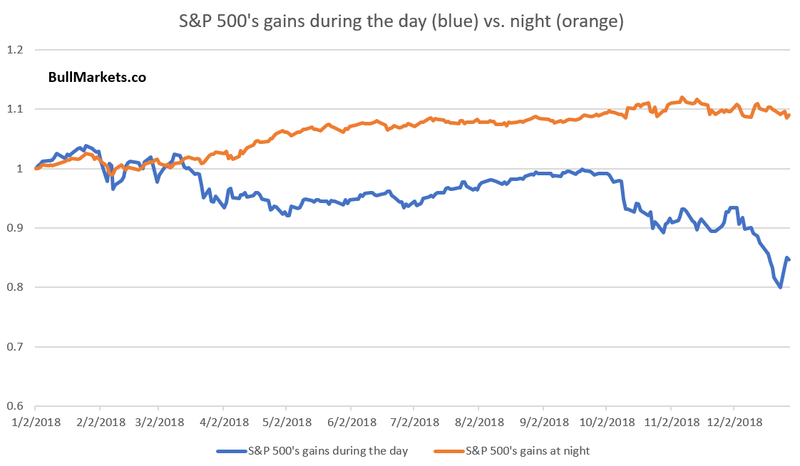 With overnight trading becoming more and more important (e.g. more foreigners trading U.S. stocks), I wouldn't see gaps as either bullish or bearish. Just an increasingly common fact of life. So far, most of the S&P's gains in 2019 have come during the day (although there has been a slight uptick in nighttime gains recently). 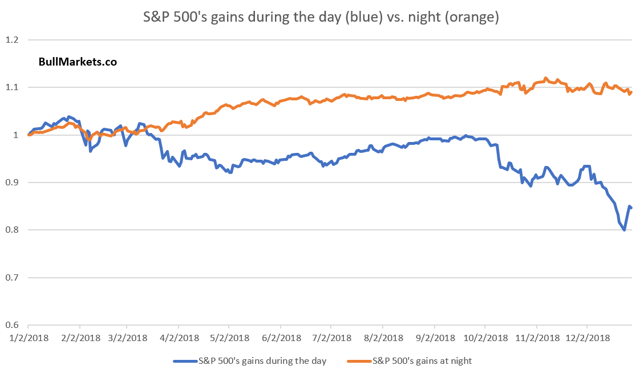 This stands in sharp contrast with 2018, when most of the S&P's gains came during the night and most of the losses came during the day. The NASDAQ made a Golden Cross on Wednesday, whereby its 50 dma crossed above its 200 dma. The NASDAQ's 9-12 month forward returns are more bullish than random after it makes a Golden Cross. 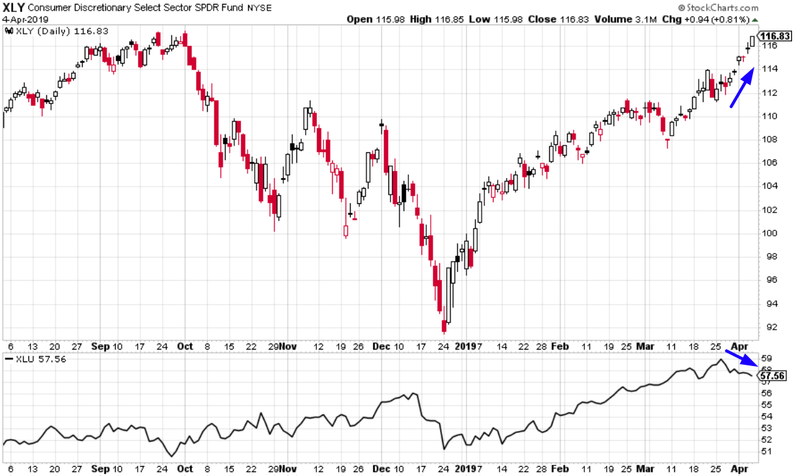 As of Thursday, XLY (consumer discretionary) and XLU (utilities - defensive) have diverged from each other. 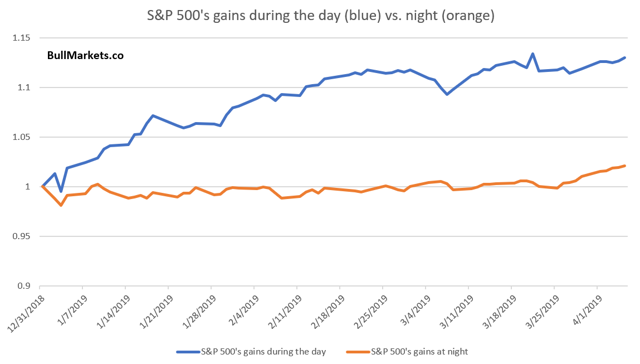 The stock market's short-term momentum is strong, with the S&P now up 7 days in a row. The last time the S&P rallied 7 days in a row was October 2017. 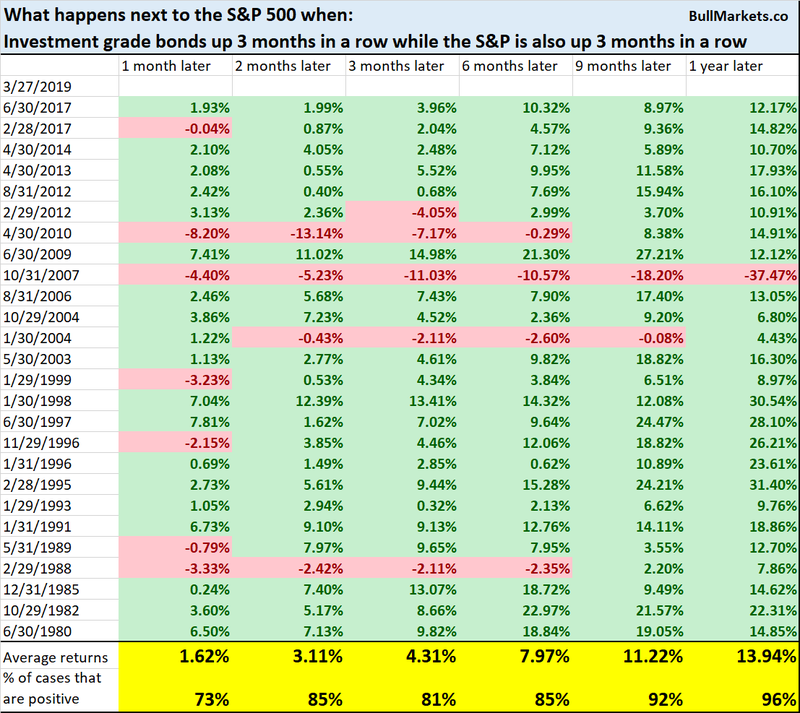 As you may recall, the stock market's momentum was extremely strong in 2017, setting many records ("record number of days without a -3% decline", "record number of days without a 3 day consecutive decline", etc.). Here's what happens next to the S&P when the S&P rallies 7 days in a row, for the first time in 1 year. While longer term forward returns are mostly random, short-term forward returns are more bullish than random. 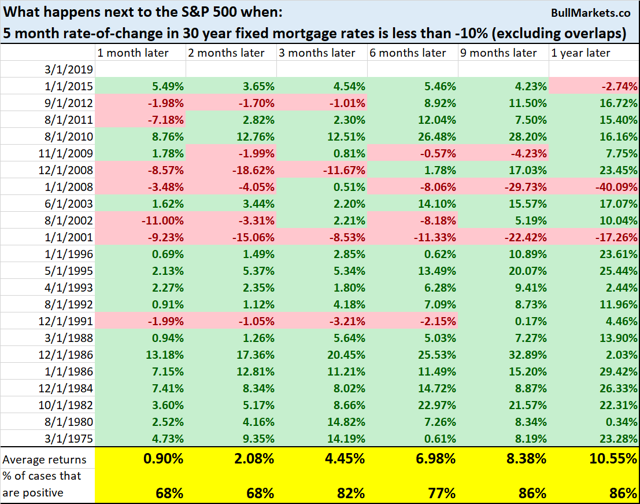 Perhaps this will be enough to push the S&P to new all-time highs soon? Goldman Sachs' Bull/Bear Indicator demonstrates that risk:reward does favor long-term bears.